Yeah, kind of brought a tear to my eye as well. Yes, in the meantime the waterlevel had dropped of course to the point where you could actually reach the horses on another horse. Not to diminish the effort of the people that got the horses to safety by realizing they would more easily follow another horse, then be led onto a pontoon by the army......but the suggested contrast between dumb firebrigade and footsoldiers on the one hand, and clever amazones on the other just wasn't there in reality. 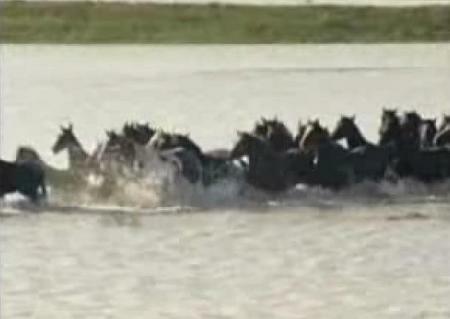 Ha, yeah, it didn't seem like that big a deal, to ride through some shallow water, in nice weather, and getting some horses to follow your horses. But, with the right setup, and some dramatic Vangelis music, and suddenly it is a great story. Horses are my kindred spirit,I own two very special geldings that have helped me grow and become who I am today. Humans should never underestimate the power of God's exquisite equine gift. I was moved and wept that 4 women should come forward and lead by example, such a simple bt profound lesson on our great planet earth.